A card that's, well, it's not really a card. This came in a pack of 2005 UD Mini Jersey Collection. These $7.00 packs had three cards and a mini-replica jersey. 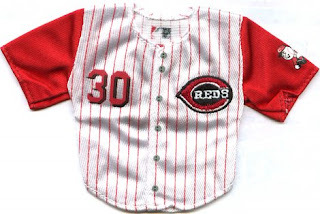 The cards themselves were nothing special, but the mini jersey is pretty cool. And, in the only pack of this that I bought, I got Ken Griffey Jr.
features little snaps. I suppose you could fit it on one of your G.I Joe action figures or something similar. The question is, what do you do with something like this? It's not going to go into an album sleeve very easily. My solution was to mount it in a small frame and display it with my other non-baseball card baseball memorabilia. As near as I can tell, Upper Deck only issued a baseball version of this set in 2005. But looking on eBay, it appears that Upper Deck is still publishing the hockey version. I looked through 5 pages of auctions and all the auctions were for hockey jerseys. 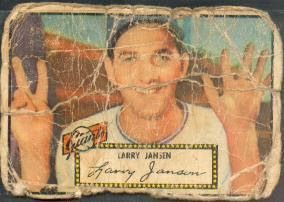 I love this card, #5 from the 1934-36 Batter-Up set. It shows off the die-cut process seen in several issues from the 1920s and 30s. As you can see from the cut line, kids could fold back the top half of the card and pose them vertically. 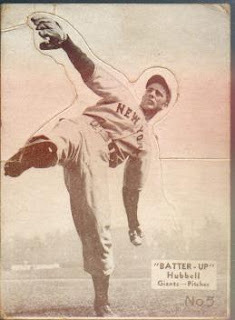 On this Batter-Up card, NY Giants legend Carl Hubbell demonstrates a Golden Age leg kick and delivery, his knuckles only a few inches clear of the mound. It's an excellent photo for the set concept and almost jumps off the card as-is. I try to avoid posting the same card on two different sites, but I'll make an exception in this case. Why? Because this card comes with it's own postage! Granted, it would never cover the cost of shipping the card today or even when the card was released in 2005, but the fact that a postage stamp is on a baseball card is awesome. It adds a whole different dimension to card collecting. The fact that the stamp depicts a play at the plate makes this card even more unique. Throw in the piece of jersey, and we've got ourselves a very interesting card that seems to want to reach out to all people and say, "Love me. Buy me. Let me be in your collection". I wasn't in the hobby when this card was produced. I was only relying on eBay to buy an occasional White Sox team set to show my support for my favorite team. I really had no clue that these existed until the lure of baseball cards pulled me back in last year. This card seems like the perfect ploy to introduce baseball cards to stamp collectors. Plus, it offers the card collector something a bit different to collect, while still staying in the comfortable realm of card collecting. It's a perfect combination! I don't know a whole lot about how baseball cards are printed. I do know that they are printed on large sheets and then sliced up into individual cards. If the cutting process isn't perfect, you get off center cards or worse. Since the cards are double sided, the fronts and the backs have to line up pretty well. Well here's something I've never seen, a card with a completely blank back. Maybe these aren't so rare, but, like I said, I've never seen one. I got this in a repack last year. These repacks are often loaded with 1987 Topps cards (I think approximately a billion sets were produced). I'm actually trying to complete the set in this manner. I could buy the set on eBay but where's the fun in that? I don't remember how many cards are printed on a sheet. There must be at least a 100 cards, maybe 200. So there must be another 199 or so blank backed cards that were printed along with this one. I'm guessing that most of these got caught by Topps quality control (maybe I'm giving them too much credit but I'd think a blank back card would be pretty easy to spot). And what were the Pirates thinking with those stove pipe hats? Back in those days I still lived in Philadelphia and the Phillies and the Pirates were in the same division. I got to see those hats a lot. This week, I finished reading The Card by Michael O'Keefe and Teri Thompson, which explores the world of the PSA 8 T206 Honus Wagner pictured at right. 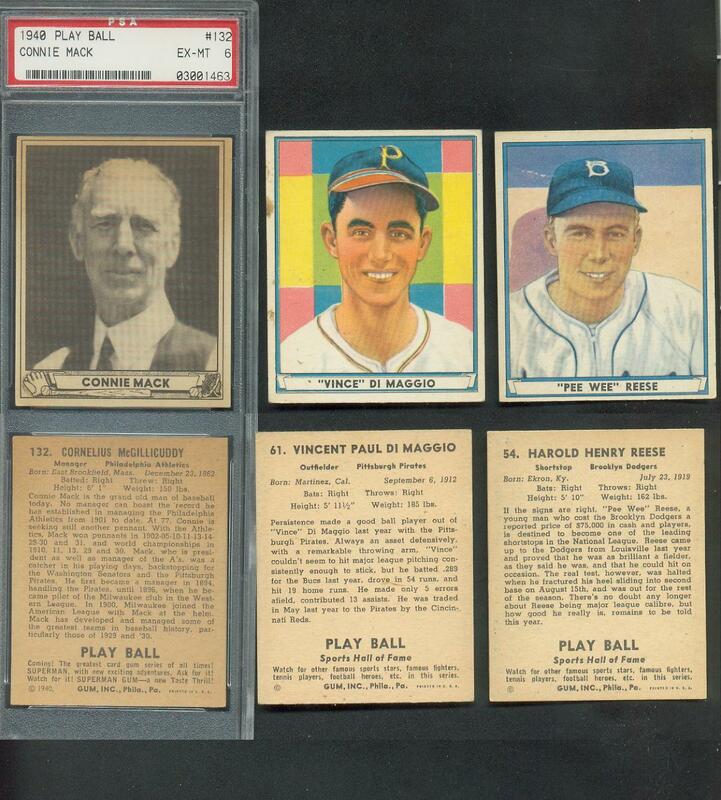 The book takes this "Mona Lisa of cards" from a Reagan-era sale at a small card shop to its present status (sold to an anonymous SoCal collector for $2.8 brazillion dollars) and expands the scope to baseball in general, Wagner's personal life, the history of his birthplace (Carnegie, PA), card trading and grading, and the score of people intimately involved with the card's ballooning value. Rather than retread the book and its conclusions about the card, a few other things appeal to me about the whole melange of myths, opinions, and weirdness that comes of having this particular symbol for one's hobby. The pair differ in one important sense, of course. You could never hope to own the painting, a true one-of-a-kind. Enough money--say, a few hundred grand--will get you a Wagner. That card will probably be pounded, folded, spindled, or mutilated. Even the PSA 8 version was, as is well-known now, probably trimmed from a printed sheet sometime in the modern era. Any kind of restoration is typically verboten for grading companies, but figures regularly into Mona Lisa's life and the fine art world in general. So why overlook it here? Prior to the grading industry, the Wagner hyper-valuation, and general rise in collectibles speculation, who could say what it meant to be a card "investor?" Wal-Mart, one of our era's biggest card sellers, faced declining revenue in the 1990s. They made a show of purchasing The Card, running a (profitable to them) store-based competition, and then giving it away live on Larry King. The winner, a Florida postal worker, quickly sold it through Christie's auction house, ending a chain of transactions with no "collectors" involved. In my collecting lifetime, an outsider's first reaction turned almost 180 degrees. "You really collect pictures of other guys?" became "wow, what's your most valuable card?" (Not that others need validate us, since God knows we're secure in our masculinity and possess amazing self-esteem.) My girlfriend even pushes me to set aside a display area in the house for my collection, rather than accuse me of never growing up. If that's all due to the perfect storm of Honus Wagner, PSA, Wayne Gretzky, Wal-Mart, and the hand of fate, should I complain? There is, of course, the shape of the card, which is sort of round. Its near-apocalyptic edge wear suggests it passed through the hands of each and every Jansen offspring before reaching me. Did Larry Jr. put daddy in his bike spokes? Use him for target practice? The card's a 1952 red back print variation, I think. Maybe Mrs. Jansen had to daub up a tomato spill, couldn't find a towel, and hey, here's an nicely absorbent card of the old man. Aside from Topps' capitalization on America's post-war baseball enthusiasm, I propose this set made a big design discovery: the card back stat grid. Can you tell those 1930s and 1940s sets were edited by newspapermen? That's a lot of text for a W/L record or batting average. The way Topps re-framed these stats made them much more readable. By the 1960s, the numbers relegated text and cartoons to virtual steerage class, something that we almost expect now. Here's a fine example from 1981. My pack-cracking inner child of the 1970s delighted in SLG % and SB counts, even as a lackluster Mariner lineup skewed my perspective. (Sorry former-me, a team 4.58 ERA wasn't good in 1979.) Oddly enough, I liked studying the numbers so much, my cards survived childhood intact. I mean, if that Mario Mendoza card didn't stay kempt and readable, maybe I'd forget his career batting average and have no way to find it again. Or at least leather textured something. This is a two ply card. The back is regular card stock. 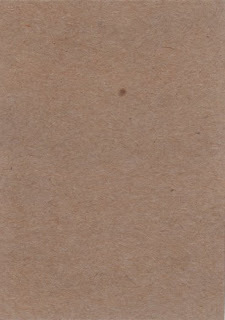 The background of the front is either real leather or imitation leather. There are cut outs in the background where the webbing of the glove is. In the photo, the black area below the foreground glove is also cut out. The player name and the Stadium Club logo are in gold foil. 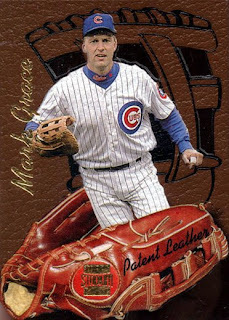 Mark played for 16 years, the first 13 with the Cubs, the last three with the D-Backs. I never got used to seeing him in a D-Backs uni. He was a 4-time Gold Glove 1st baseman and a 3-time All-Star. His life-time fielding percentage is 0.995. 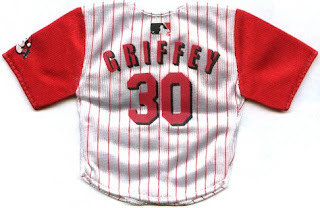 1996 was one of his best years with a fielding percentage of 0.997. How good is that? He had 1,259 put-outs, 107 assists and only 4 errors. He was also a career 0.303 hitter with 173 home runs. I know that this is a picture of Brian Downing's follow through. It almost looks like he's trying to down a football or praying to the baseball gods in some bizarre ritual. What exactly was going on in this photograph? Was this a home run or a high towering pop up? Did Brian swing and miss... badly? Did he think that placing one knee on the ground would stop the play? We may never know. Judging by the way Brian looks in the photo, I'd say it was likely the he popped the ball up and out of play. No one teaches swings like that anymore. Yet, Brian was in the majors for close to two decades. 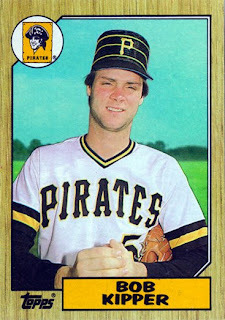 This is a guy who was 1 for 1 in his 1979 All-Star Game appearance, which was his only trip to the mid-season classic. Brian was on his way out when this photo was taken. He still hit a respectable .278 in 1991, in 123 games. 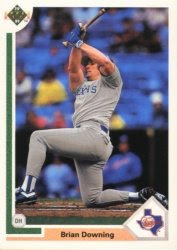 It was probably swings like this that limited his playing time to nineteen years, which is nothing to sneeze at. The Rangers would be Brian's last stop in the majors. He is probably best known for being an Angel, but he also put in five years with the White Sox at the beginning of his career. I'm happy that someone captured this image on a card. If it didn't exist, who would believe that Brian Downing dragged his right knee on the ground during his swing? This isn't so much a thing done to a card as it is a Thing Done to Nelson Liriano. This beauty from 1990 Topps depicts Liriano hopelessly chasing a popup. And I could be wrong, but I don't think the technique they teach involves stretching your glove arm to the limit, flailing your throwing hand wildly, and generally looking panicked. Now, Liriano wasn't an awesome player, but I don't think this photo accurately represents his defensive prowess. 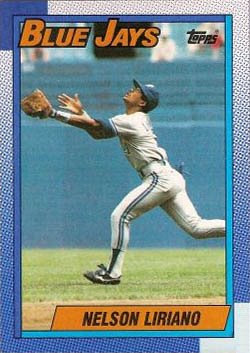 Had Topps chosen to show Luis Polonia missing a fly ball, then I would have had no beef whatsoever.